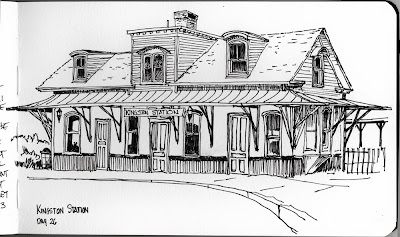 This morning before going into the office I drove down to the Kingston Station in West Kingston, RI. 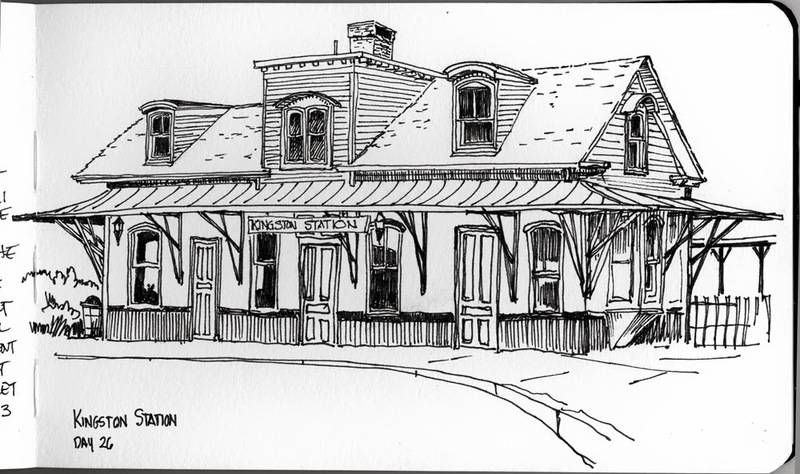 ( I found on line that it was built in 1875) It was raining this morning so I sketched from inside my car. During the time that I was there several Amtrak trains came and went, quite a few RIPTA buses (most with at least one bike in the front rack) and many cars came and dropped off and picked up people. This is a busy place at 6:30 - 7:30 in the morning. This image represents Day 26 of the 75 Day Sketch Challenge and I now long for color. This would certainly be a better sketch if I had put some brushes on the paper. Even in the dull rainy morning there was a lot of good reflected light up under the eves and a nice wet shine on the tin roof of the porch. I also wish I had more time and could have used a pencil to layout the perspective of the building a bit better - some things just aren't right.